The terms credit card and charge card are often used interchangeably, but they're not quite the same thing. Actually a charge card is a type of credit card, but not all credit cards are charge cards. Charge cards let you make purchases, but unlike other credit cards, they usually require you to pay your balance in full each month when your bill is due. Because you're not allowed to carry a revolving balance from month to month, there is no interest rate associated with a charge card. American Express and Diners Club International dominate the charge card market. 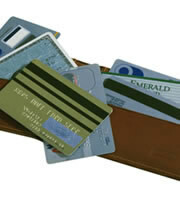 There is no pre-set spending limit on charge cards, although that doesn't mean unlimited spending. Your purchasing power adjusts with how you use the card, your payment history, and financial resources. You'll need an excellent credit score to qualify for a charge card. Using a charge card responsibly can help you maintain your good credit rating, just as using credit cards responsibly helps build a solid credit history, according to the company that developed the FICO credit score. And charging purchases on your card doesn't hurt your credit score. Because there is no credit limit on charge cards, the balances are not included in the calculation of credit utilization -- the amount of debt compared to available credit, a significant factor in credit scores. Rewards aren't restricted to revolving credit card accounts. You can earn rewards from spending with charge cards and get benefits, such as travel discounts and complementary travel insurance. Although you don't have to pay interest on a charge card, you do have to pay an annual fee, which is usually heftier than for credit cards -- often more than $100. You also pay fees for special services, such as cash advances, and, if you're late paying your bill, you face a penalty fee. 0 Responses to "Charge card vs. credit card: what's the difference?"